It's easy to dress up your chandelier for the Christmas holidays. Even if you don't have a chandelier, you can make one out of ornaments. 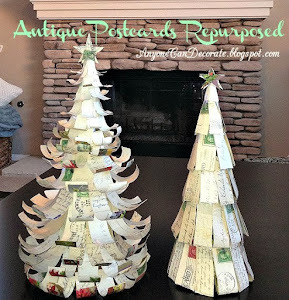 In addition to ornaments you can also add, greenery, berries, poinsettia flowers, pine cones and holiday ribbon. The only limit is your imagination. 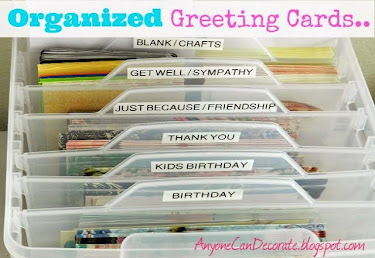 Be creative and have fun doing this easy DIY project. 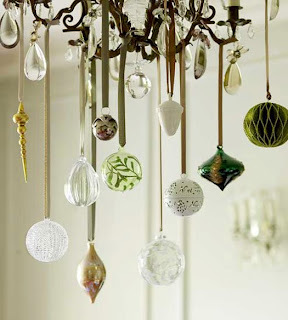 This first chandelier is very easy to do. This one was done with neutral colors, but you can choose whatever colors you prefer. 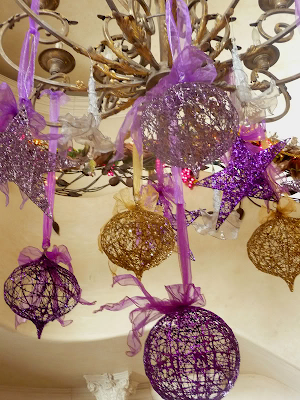 Just place a variety of ornaments on different lengths of ribbon and tie randomly all around the chandelier. Simple and beautiful! I love this next chandelier. Start with a large twig or a thin bare branch. 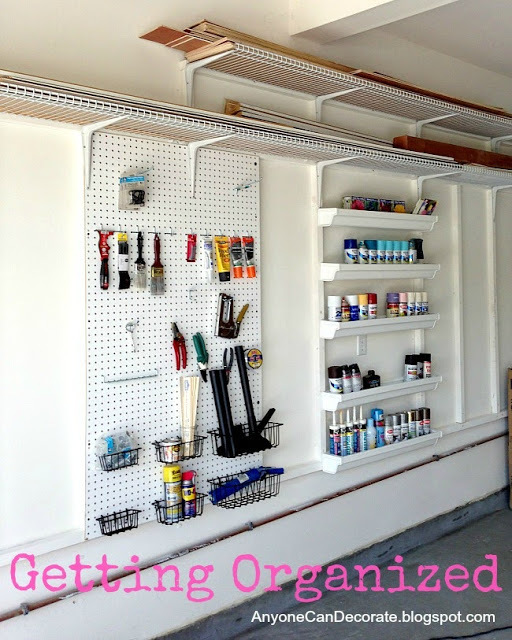 Place two cup hooks securely into the ceiling (each hook into a stud or use ceiling anchors, which can be found at any hardware store). Spaced them evenly apart (2 or 3 feet apart - actual distance depends on size and length of branch). Suspend branch with a sturdy fishing line, wire or twine. I like a sturdy fishing line because it appears near invisible (Walmart carries fishing line in the sporting goods area). 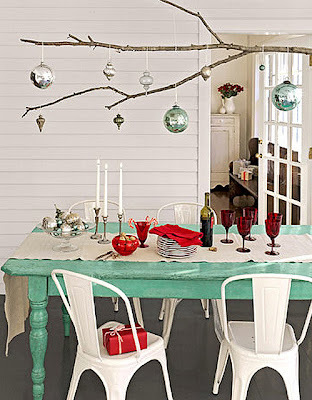 The lowest hanging ornaments should hang at least 28" from table. 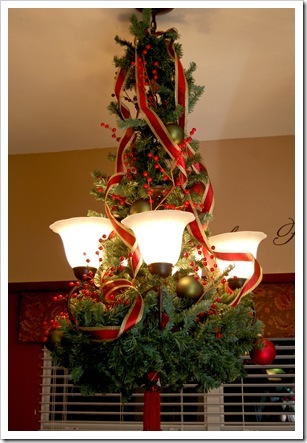 When doing this DIY project, it is easiest to hang the branch first and then hang your ornaments. 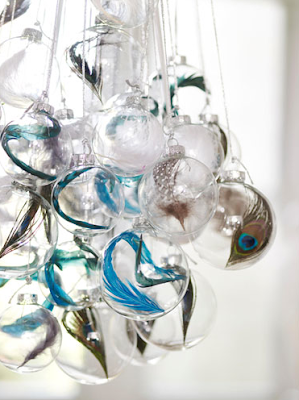 Hang ornaments at random heights and spacing until you achieve a look that you love. 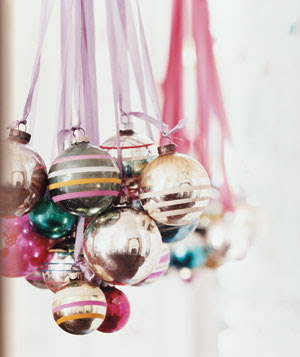 Ornaments can be hung with ribbon, twine, or fishing line. This creates a stunning, one of a kind decoration that is sure to be a conversation piece around the dining table. This next chandelier is easier to make than it looks. 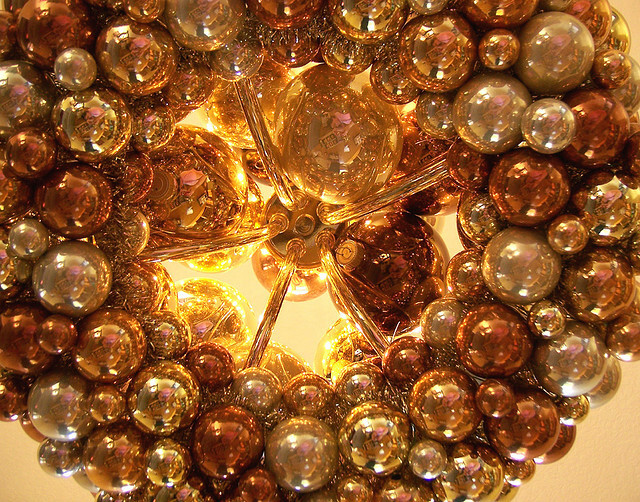 The large wreath of ornaments is premade prior to hanging on the chandelier. The ornaments are all attach to a wreath (likely a wire wreath frame - Note: floral wire is a good product for wiring the ornaments to the wreath... 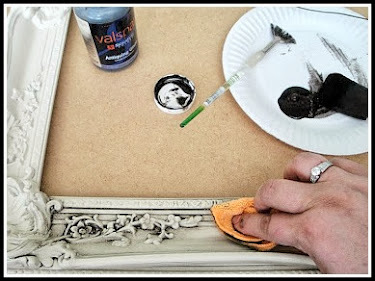 The wire wreath frame and the floral wire can be found at most craft stores). After making the wreath, or buying one, you can wire it up via the bottom of your chandelier. Attach it to your chandelier arms. Floral wire is relatively thin, but sturdy and is great for many craft project. On the chandelier below, additional ornaments were hung from the top middle of the chandelier to give this a full look. 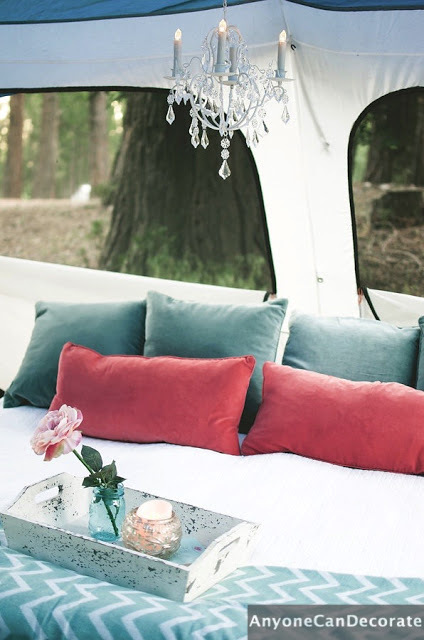 It's a little over the top for some, but in the right setting would be quite stunning! 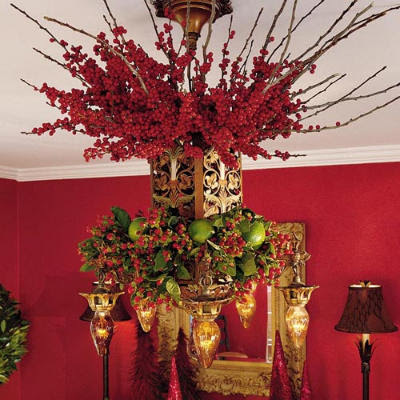 This next chandelier is achieved by attaching (wiring) a greenery wreath to the bottom of the chandelier, then wiring greenery from the top of the chandelier chain to the middle of the chandelier... Next attaching ornaments at random spacing, adding berries and some wire edged ribbons from the top. 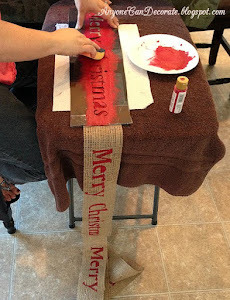 Wire edged ribbon allows you to curl the ribbon for the effect shown. 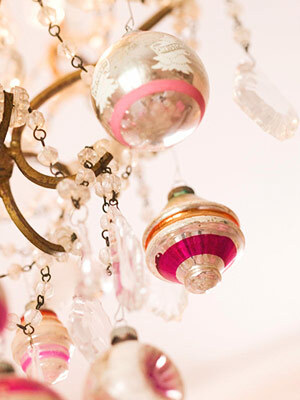 I hope these chandeliers and this blog have inspired you to create your own one of a kind Christmas holiday chandelier or multiple chandeliers throughout your home. A chandelier adds such a nice warmth and intimacy to the dining experience. I found all of these chandelier pictures on Tumblr and each of them has inspired me. 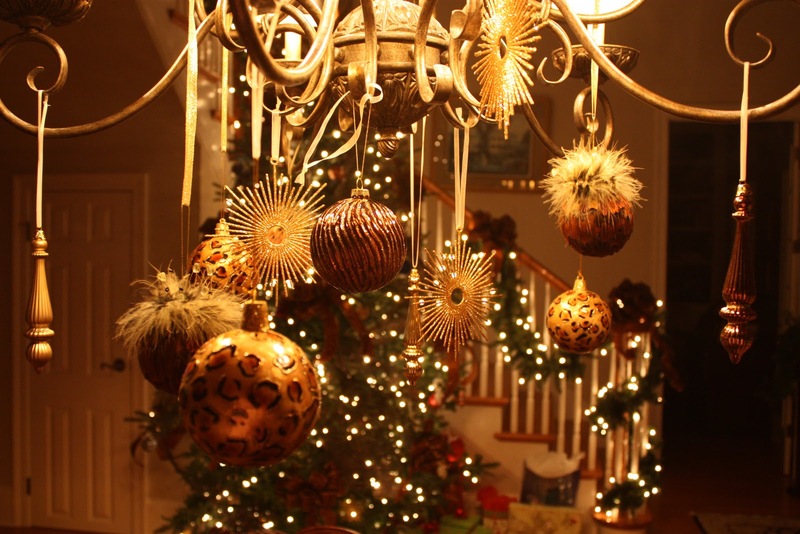 I hope to soon make my own Christmas chandelier for our house. I do not know the original source of these photos, but if any of you know where they came from, let me know as I would love to give each creator credit for their beautiful work! Decorating can be easy and is so much fun... Have fun, be creative and don't forget to take pictures and share them with us!